Can a cough without wheezing be due to asthma? What sports are best suited for exercise induced asthma? What sports are not? Symptoms of asthma include cough, rapid breathing, fatigue, sighing, difficulty sleeping, anxiety, and difficulty concentrating. These symptoms can mimic other illnesses. Asthma can be mimicked by other conditions, such as heart failure, bronchitis, emphysema, bronchiectasis, bronchial obstruction, vocal-cord dysfunction, and hypersensitivity reactions. Exercise is a common trigger for asthma and may cause symptoms in 80% to 90% of asthmatics. Exercise-induced asthma is managed by choosing an appropriate sport, controlling the asthma prior to events, warming up, avoiding cold, stopping exercise during an asthma attack, cooling down after exercise, and preventing episodes with the use of inhalers, bronchodilators, and certain anti-inflammatory medications. What do all of these individuals have in common? An active 13-year-old becomes breathless shortly after her soccer games and coughs on a cold winter's night. A young woman has a dry, hacking cough that has persisted for a year after her last "cold." A teenager sleeps poorly and is awakened early every morning with chest tightness and difficulty breathing. What these individuals have in common is the possibility that they all may have asthma. noises emanating from the chest usually during exhalation. To complicate matters, symptoms of asthma are not consistent and often vary from time to time in an individual. In some patients, symptoms are influenced by diurnal factors; for example, some patients experience asthma primarily at night (nocturnal asthma) rather than during the day. Furthermore, episodes of asthma can be triggered by many different factors such as allergens, dust, smoke, perfumes, cold air, exercise, infections, medications, and acid reflux. Finally, other illness such as heart failure, bronchitis, and dysfunction of the vocal cords can cause symptoms that mimic those of asthma. For these reasons, accurately diagnosing and treating asthma can be a challenge. For a comprehensive review of symptoms, causes, and treatments of asthma, and for a better understanding of the normal anatomy of the airways (trachea, bronchi, bronchioles and the lung), please visit the asthma article. Chronic coughing is frequently defined as a cough that lasts longer than three weeks. Chronic cough can have several causes such as postnasal drip, pneumonia, bronchitis, cigarette smoking, acid reflux, heart disease, tumors in the lung (benign or malignant), foreign body aspiration, and medications such as ACE inhibitors used for treating high blood pressure. Asthma also can cause chronic cough. A chronic cough may be the only symptom of asthma. The cough may first appear after a cold or an upper respiratory tract infection. The cough may also start as a "tickle" in the throat. In some patients with asthma, laughing or exercise can bring on coughing. Other patients tend to cough at night while others cough at any time of day without provocation. It is very important that anyone with an undiagnosed chronic cough receive a chest radiograph to exclude more serious disease. Coughing due to asthma may not respond to cough suppressants, antibiotics, or cough drops but only to medications for asthma. Therefore, accurately diagnosing asthma (by using pulmonary function tests) is important. Thus, a doctor, preferably a lung specialist or an allergist, should evaluate any cough that does not resolve on its own within three to six weeks. More than 90% of patients with asthma experience nighttime wheezing and coughing. Symptoms of asthma are most common between midnight and 8 a.m. and are important causes of insomnia and sleep deprivation among patients with asthma. In fact, sleep disturbances in patients with asthma usually mean that there is inadequate control of the asthma and should prompt a visit to the doctor to re-evaluate the treatment being used for the asthma. It is possible to test for nocturnal asthma by taking measurements of airflow out of the lungs during expiration in the evening and again upon awakening in the morning. This is done with a small portable meter that measures the flow of air. (An asthma specialist can demonstrate the correct technique for making these measurements.) A greater than 20% decrease in the peak flow measurement from the evening to the morning suggests nocturnal asthma. "All that wheezes is not asthma." Other medical conditions can mimic asthma and make the correct diagnosis of asthma more difficult. Cardiac asthma usually occurs in elderly people who have wheezing and shortness of breath that are due to heart failure. When the heart is too weak to pump blood effectively, fluid will accumulate in the lungs. Fluid in the lungs causes shortness of breath and wheezing. 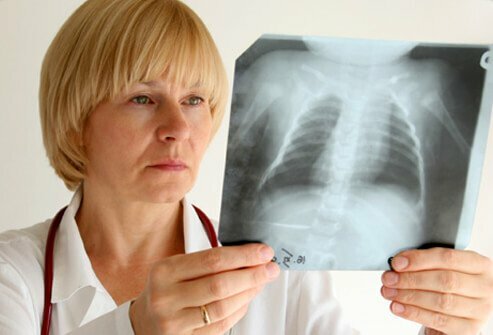 A chest X-ray can be helpful in diagnosing heart failure by demonstrating an enlarged heart (usually a sign of heart failure) along with fluid in the tissues of the lung. Lung function testing can sometimes help to distinguish between these problems. In heart failure, spirometry can be reduced uniformly, so called restriction. In asthma, generally, airflow is obstructed and the volume of air exhaled in the first second of the test is reduced when compared with the total forced exhaled volume. Treatment of heart failure involves using diuretics (water pills) to rid the lungs of excess fluid and medications to help the heart muscle pump more effectively. When the heart failure has been adequately controlled, the wheezing will cease. Some people may suffer from asthma and heart failure simultaneously. These patients require treatment for both conditions. Acute bronchitis. Acute bronchitis is an infection, usually viral or bacterial, of the bronchi, the larger airways or breathing tubes. The symptoms of acute bronchitis include fever, cough, yellow or green sputum, and, sometimes, wheezing. This combination of coughing and wheezing is sometimes referred to as "asthmatic bronchitis" or post-viral bronchial hyperreactivity of the airways. Acute bronchitis is generally treated with antibiotics and/or anti-inflammatory medications such as corticosteroids. The coughing and wheezing usually subside within a few weeks. Some patients with asthma can produce green mucus that may not reflect an ongoing infection but the consequence of airway inflammation or allergic response. Generally, in an infectious processes, inflammatory white cells known as neutrophils are activated to fight off this invader. Whereas, the particular inflammatory white cells of asthma tend to be eosinophils, which work mainly on the allergic pathways. Both of these inflammatory cell types can cause the mucus to be yellow to green in color. Chronic bronchitis. Chronic bronchitis is usually defined as a daily cough with production of sputum for three months for two years in a row. The most common cause of chronic bronchitis is cigarette smoking. With chronic bronchitis, there is longstanding inflammation and swelling of the inner lining of the airways, which cause narrowing of the airways. The inflammation also stimulates production of mucous within the airways that becomes the sputum produced by coughing. Infections of the airways with viruses or bacteria are common among individuals with chronic bronchitis. Infections further aggravate the inflammation and narrowing of the airways, worsening the symptoms of shortness of breath, coughing, and wheezing. Treatments include antibiotics, quitting cigarette smoking, bronchodilators to expand the airways, and corticosteroids to reduce the inflammation. Emphysema. Emphysema is a disease where there is permanent destruction of the walls of the air sacs (alveoli) and the small airways (bronchioles). The destruction of the alveolar walls reduces the elasticity of the lung. Loss of elasticity leads to the collapse of the bronchioles, obstructing airflow out of the alveoli. Air becomes "trapped" in the alveoli. Air trapped in the alveoli cannot be exchanged for room air, and this reduces the ability of the lung to get rid of carbon dioxide and take in oxygen. Emphysema is most often caused by years of cigarette smoking; however, a genetic disease, alpha-1 antitrypsin deficiency, also causes emphysema. Chronic obstructive pulmonary disease (COPD) is a category of lung diseases that include chronic bronchitis, emphysema, bronchiectasis, and chronic asthma (asthma in which lung function does not return to normal after an attack). These diseases usually occur in varying combinations, hence the need for an overall category. The major symptom of emphysema is shortness of breath. Patients with emphysema also may wheeze if they also suffer from chronic bronchitis and/or asthma. Treatment of these latter patients begins with smoking cessation and the use of inhalers to deliver bronchodilators and corticosteroids to the lungs. Antibiotics, oxygen, and surgery in the advanced stages of these diseases also can be helpful. Bronchiectasis. Bronchiectasis is a chronic condition in which the bronchial tubes (larger airways) are damaged by repeated bronchial infections. The major symptom of bronchiectasis is a persistent cough with thick and usually green mucus. Bronchiectasis is treated with bronchodilators, antibiotics, and corticosteroids when flare-ups occur. Cystic fibrosis is an inherited condition in which the affected patients can produce thick mucus that plugs the bronchial tubes. The plugging of the bronchial tubes causes repeated bouts of bronchitis and pneumonia, leading to the development of bronchiectasis. Localized bronchial obstruction. Wheezing and coughing can be symptoms of a localized obstruction of the airways (the bronchial tubes or trachea). The wheezing represents the sound of air rushing around the blockage, and the coughing is the body's effort to clear the blockage. The most common causes of localized airway obstruction are foreign bodies such as accidentally inhaled peanuts, bronchial tumors, and the narrowing of the trachea that occurs after a tracheostomy. The wheezing and coughing due to a localized obstruction will not respond to medications for asthma. The treatment is to relieve the obstruction. Vocal cord dysfunction is an episodic condition involving sudden closure of the voice box (larynx) as a result of the two vocal cords sticking together. This can be physiologic, that is the vocal cords are not working properly due to dysfunctional nerves or structural abnormality. This condition usually requires involvement of ENT physician and often will not correct itself spontaneously. It can also be caused by paradoxical vocal cord movement, factitious asthma, spastic dysphonia, and globus hystericus. The symptoms of vocal-cord dysfunction are the sudden onset of difficulty breathing and talking, and panic. This can result in a high pitched inspiratory sound, referred to as stridor. Vocal cord dysfunction often is misdiagnosed and treated as asthma because both conditions may have symptoms of wheezing; however, with vocal-cord dysfunction, wheezing usually occurs during inspiration (breathing in), while with asthma, wheezing occurs during expiration (breathing out). Medications used for treating asthma are not effective for treating vocal-cord dysfunction. Since a correct diagnosis of vocal-cord dysfunction can be difficult, affected people may have repeated episodes that are inappropriately treated as attacks of asthma. The diagnosis often requires a careful, direct inspection of the vocal cords, typically by an ear, nose, and throat specialist. The attacks of vocal-cord dysfunction when psychological usually resolve spontaneously (on their own). Sometimes these cases can present quite dramatically, and raise concerns about potential respiratory arrest. Occasionally , a tracheotomy tube is inserted because of concerns of a true physiologic abnormality. Vocal-cord dysfunction often is associated with acute panic or anxiety attacks that require antianxiety medications, speech therapy, and psychotherapy in order to prevent episodes. Inhaled mold spores and particles from bird droppings and feathers (such as from parrots) can cause hypersensitivity (allergic) reactions in the bronchial tubes and the lungs. For example, when Aspergillus fungal spores cause an allergic reaction in the bronchial tubes, the condition is called allergic bronchopulmonary aspergillosis. Affected individuals have both asthma and bronchiectasis which require treatment with both bronchodilators and corticosteroids over a prolonged period of time. Sometimes antifungal therapy is used, as well. When the lung tissues develop an allergic reaction to inhaled bacteria, fungi, or bird particles, the condition is called hypersensitivity pneumonitis (HP). HP is differentiated from acute asthma by the lack of wheezing, the presence of a fever, and the pattern of pneumonia on the chest X-ray. HP is treated by avoiding the allergens and administering corticosteroids. Sports and asthma are not mutually exclusive. In the 1996 Olympic Games, one out of every six athletes had asthma. These Olympians competed in a variety of sports such as track and field, mountain biking, kayaking, cycling, and rowing. The following is an abbreviated list of athletes who have competed despite their asthma. Exercise is a common trigger for asthma and may cause symptoms such as chest tightness, shortness of breath, and coughing in 80%-90% of patients with asthma. The symptoms usually start about 10 minutes into the exercise or five to 10 minutes after completing the activity, although some people experience symptoms about four to eight hours after exercise. Although exercise-induced asthma may affect all ages, it is most common in children and young adults. All athletes, from weekend warriors to professionals and Olympians, can be affected. This common occurrence of exercise-induced asthma among individuals with asthma has led to the misconception that asthmatic patients cannot exercise. As a result, children with asthma often stay in the library or homeroom while the rest of the class is in the gym. Adult asthma patients may attribute their breathing difficulties during exercise to being "out of shape" and hence curtail their level of exercise. For most asthma patients, however, exercise-induced asthma is treatable and preventable, thereby allowing children and adults with asthma to fully participate in sports and exercise. Regular exercise is beneficial for the heart, circulatory system, muscles (including breathing muscles), and mental health, but it will not cure the asthma. Environmental allergens, pollutants, or irritants inhaled during exercise may help trigger the symptoms. Prolonged, strenuous exercises without rest periods and exercising in cool, dry conditions can also bring on exercise-induced asthma. There are two theories to explain why this occurs. Rapid breathing during exercise does not allow inspired air to be warmed and humidified by the nose. This cold, dry air cools the bronchial tubes, causing the muscles around the bronchial tubes to constrict (producing bronchospasm). After exercise, the bronchial tubes warm up. In asthma patients, warming up of the bronchial tubes causes the bronchial tubes to swell and become inflamed. This might explain why asthma occurs after exercise. This may be similar to what happens when previously cold fingers are warmed and they become red and swollen. The second theory involves the loss of humidity surrounding the cells lining the bronchial tubes during rapid breathing. This drying induces the mast cells (cells that contain chemicals that can trigger asthma and other allergic reactions) to release their chemicals, causing bronchospasm and inflammation. Swimming is one of the best exercises for those with exercise-induced asthma. Breathing the usually warm, humid air prevents cooling and drying of the airways. Sports that involve short bursts of exertion interspersed with rest periods are preferable. Tennis, golf, baseball, and volleyball are among the sports meeting this description. The resting periods allow the airways to recover, which usually prevents the onset of exercise-induced asthma. 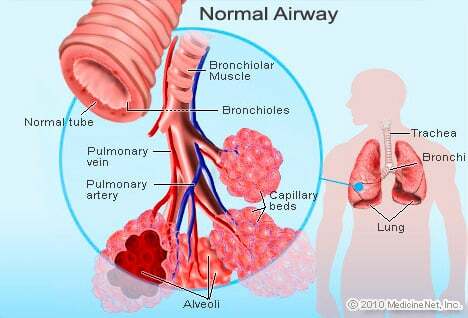 Rapid breathing of cold, dry air is a potent stimulus of bronchospasm in asthmatic patients. Therefore, outdoor winter sports, such as skiing, may be the most problematic. It is best to choose a sport that does not require continuous vigorous outdoor exercise such as running, bicycling, or cross-country skiing. Make sure that your asthma is under good control before you begin exercising. Refrain from exercise and consult your doctor if your asthma is poorly controlled. Warm up for at least 10 minutes prior to exercise. This takes advantage of a "window of safety" which may last up to an hour, often preventing exercise-induced asthma. Avoid exercising in cold, dry air and on smoggy days. Covering the mouth and nose with a scarf in cold weather can be helpful. If asthma symptoms occur during exercise, stop immediately and rest. Do not attempt to "run through" the symptoms. If your breathing difficulty continues, use an inhaled bronchodilator. Following completion of exercise, do "cool down" exercises for 10 minutes to allow the bronchial tubes to re-warm slowly. Preventative use of inhalers that contain cromolyn sodium (Intal) or bronchodilators, such as albuterol (Ventolin, Proventil), 15 to 20 minutes before exercise is usually effective. The leukotriene modifiers, montelukast (Singulair) and zafirlukast (Accolate), taken daily in pill form have been found to help prevent exercise-induced asthma in some athletes. GERD is a common condition caused by the regurgitation (reflux) or backwash of stomach acid into the esophagus from the stomach. At times, the acid even may regurgitate into the back of the throat and reach the lungs. GERD usually -- but not always -- is associated with a burning discomfort under the breastbone, called heartburn, which occurs mostly after meals or when lying down. In some patients, the symptom of acid reflux is not heartburn. Instead, they experience coughing, wheezing, hoarseness, or sore throat. The presence of acid in the esophagus or the passage of acid into the lungs (aspiration) may cause the bronchial tubes to constrict (bronchospasm), causing wheezing and coughing that may not respond to medications for asthma. Bronchospasm related to acid reflux tends to occur more frequently at night as a result of lying down. GERD is common among patients with asthma. Some doctors believe that asthma itself or asthma treatments in some way make asthma patients more susceptible to acid reflux. For example, theophylline, an oral medication occasionally used to treat asthma, may promote acid reflux by relaxing the specialized muscles in the esophagus that normally tighten to prevent regurgitation of acid. In patients with nocturnal or difficult-to-control asthma, treating acid reflux may help relieve coughing and wheezing. Treatment of GERD involves elevating the head of the bed, losing weight, avoiding spicy food, caffeine, alcohol, chocolate and cigarettes. Proton-pump inhibitors such as omeprazole (Prilosec), pantoprazole (Protonix), rabeprazole (Aciphex), lansoprazole (Prevacid), and esomeprazole (Nexium) are potent inhibitors of production of acid in the stomach and are effective treatments for asthma aggravated or caused by acid reflux. Histamine blockers such as ranitidine (Zantac) and famotidine (Pepcid) are also used. Rarely, surgery is performed to prevent acid reflux for severe cases of GERD that do not respond to medications. There is a clear association between allergic rhinitis (hay fever) and asthma. The question of which comes first -- the allergic rhinitis or the asthma -- is not easily answered. Many patients recall developing their asthma and nasal symptoms at or about the same time. Others developed their asthma either before or after the onset of their allergic rhinitis. We now know that almost all patients with allergic asthma also have allergic rhinitis. Additionally, roughly one-third of people with allergic rhinitis will develop asthma. Patients with both conditions can expect to suffer more severe asthmatic attacks and require stronger medications to treat their asthma. Patients with allergic rhinitis should be vigilant about reporting any persistent coughing or wheezing to their doctors. The presence of asthma can easily be determined with pulmonary function tests. The nerves of the upper airway (nasal cavity) and the lower airway (bronchial tubes) are connected. Both the upper and lower airways are exposed to the same external environment during breathing. When allergens reach the nasal cavity, there is stimulation of nerve endings in the nasal cavity. This stimulation causes reflex neural signals to be sent to the tissues of both the nasal cavity and the lower airways. In the nasal cavity, these signals cause accumulation of fluid and the formation of mucus, while in the bronchial tubes they cause bronchial constriction and possibly acute asthma. This is sometimes referred to as the naso-bronchial reflex. Nasal congestion causes mouth breathing. During mouth breathing, air bypasses the nose. It is not filtered for allergens and irritating particles, and it is not warmed or humidified. This non-conditioned air is more likely to cause bronchial hyperreactivity and produce asthma symptoms. Mucus from the nasal cavity may drip from the back of the nose into the bronchial tubes, especially during sleep. This dripping mucus increases bronchial inflammation and causes episodes of asthma at night. Over the years, physicians have noted an association between asthma and sinusitis. In fact, 15% of patients with sinusitis also have asthma (as opposed to 5% of the normal population). An astounding 75% of severely asthmatic patients also have sinusitis. Additionally, asthmatic patients often report that their symptoms worsen when they develop sinusitis. Conversely, when the sinusitis is treated, the asthma improves. The reasons behind the association of asthma and sinusitis are similar to those suggested for the association between asthma and allergic rhinitis. The infected mucus from the sinuses may drain into the bronchial tubes, thereby causing bronchitis (sinobronchitis). The inflammation caused by the mucus may worsen asthma. The best evidence to date seems to support the idea of neural reflexes in the linings of the nose, sinuses, and airways. Sinusitis may activate a "sinobronchial reflex" and worsen asthma. Greater insight into how these two conditions are related may allow better control or even cure of these common conditions. Poor air quality is known to worsen asthma symptoms and increase exacerbations. Diesel emissions are associated with asthma and increased symptoms. Living closer to freeways may result in more frequent exacerbations. Patients with asthma are at increased risk for symptoms when smog, soot, or ozone levels are significantly elevated. Children with smaller body size and developing lungs are at increased risk for breathing problems. Indoor air pollution may also be a contributing factor. In the third world, indoor fires used for cooking are often associated with respiratory illness. In the industrialized world, formaldehyde, tobacco smoke, dust mites, and other particles can worsen asthma. Air filters are suggested by some to help minimize their effects on asthmatic patients. Research studies would suggest that maintaining adequate ventilation and modifying the household (removing carpets and drapes, using hypoallergenic mattress covers) may be enough. Some air-filtration systems may reduce some secondhand tobacco smoke, but no system can remove all the harmful components from this smoke. There are no standards for air filtration approved by the Food and Drug Administration (FDA). It does rate some portable air-filtration systems as Class II medical devices, indicating safety and medical benefit. If one of the devices is being considered for personal use, it is important to check that the device has this Class II approval. There are several different types of air filters. Mechanical filters force air through a mesh trapping particles. HEPA (high efficiency particulate air) are mechanical filters that capture at least 99.97% of all particles 0.3 microns or larger. Electronic filters use electrical charges to attract and deposit allergens and irritants on collecting plates. There are also hybrid systems that contain both mechanical and electronic filters. All of these can produce some ozone but usually at acceptable levels. Gas phase filters can remove odors and gasses such as cooking gas, fumes from paints and building materials, and perfume. They do not remove any allergenic particles. Ozone generators are ozone producers. This gives the "smell of clean air." Unfortunately, the ozone levels produced are often higher than acceptable levels. These devices are not recommended. Food intolerance is very common but is not food allergy since it does not involve the immune system. Often this can present with abdominal discomfort after eating the certain food. Lactose intolerance is a classic example and occurs when dairy products are eaten and the individual does not have the proper digestive enzyme for these diary products. Food allergy on the other hand involves the immune system and the production of specific antibodies to components of the food. These antibodies are usually of a specific type called immunoglobulin E (IgE). The most common food allergens are the proteins in cow's milk, soy, fish, shellfish, eggs, and peanuts. Usually, the symptoms of food allergy relate to problems with the skin. Hives, which are raised, red, warm and itchy lesions, can develop suddenly. Atopic dermatitis (eczema) is more chronic and appears as raised, itchy, scaly lesions. Gastrointestinal symptoms can also occur. Severe reactions can occur rarely and result in failure of the respiratory system and/or cardiovascular collapse. This is referred to as anaphylaxis. Asthma, too, can occur following exposure to a food substance to which an individual is allergic. The optimal management of these food allergies is avoidance of the offending food if possible. When one discovers or suspects that a food allergy may be present, an evaluation and testing by a professional with expertise in allergies (allergist, immunologist) is recommended. These professionals will often perform a variety of skin tests and blood tests looking for evidence of IgE antibodies to the suspected offending substance. A food diary involving a detailed record of all substances consumed can be helpful in discovering the offending food. Once discovered, complete avoidance of these foods is recommended. "An overview of asthma management." UpToDate.com. Varney, et al. "The successful treatment of vocal cord dysfunction with low-dose amitriptyline-including literature review." J Asthma Allergy 2i (2009): 105-110. What causes asthma? Are there home remedies for asthma? Learn all about asthma symptoms and signs, asthma attack, medications, inhalers, exercise induced asthma, asthmatic bronchitis, asthma treatment, and other facts. Do you or a relative have exercise-induced asthma? Please share your experience. Do you have asthma and GERD? If so, please share your experience. Do you have food allergies in addition to asthma? In what ways do you manage both? Did you have unusual symptoms that ended up being diagnosed as asthma? Please share your experience. Look at the anatomy of an asthma attack. See these warning signs and symptoms to avoid an asthma emergency such as a persistent cough, changes in breathing, cyanosis and more. There is currently no cure for asthma, and no specific, single cause for asthma has been identified. Take this quiz on asthma myths to test your asthma IQ and take an active role in your own health. Asthma is a chronic disease of the airways of the lungs, which can be managed with proper treatment. Triggered by two main causes, asthma symptoms can be brought on by environmental factors and surprising allergens. A tiny tube in the air conduit system within the lungs that is a continuation of the bronchi and connects to the alveoli (the air sacs) where oxygen exchange occurs. See a picture of Bronchioles and learn more about the health topic. Bronchitis is inflammation of the airways in the lung. Acute bronchitis is is short in duration (10 to 20 days) in comparison with chronic bronchitis, which lasts for months to years. Causes of acute bronchitis include viruses and bacteria, which means it can be contagious. Acute bronchitis caused by environmental factors such as pollution or cigarette smoke is not contagious. Common symptoms for acute bronchitis include nasal congestion, cough, headache, sore throat, muscle aches, and fatigue. Acute bronchitis in children also my include runny nose, fever, and chest pain. Treatment for acute bronchitis are OTC pain relievers, cough suppressants (although not recommended in children), and rest. Infrequently antibiotics may be prescribed to treat acute bronchitis. Asthma nebulizers, or breathing machines, convert liquid medication into mist for easy inhalation.